I’ve been looking for a way (and time) to wrap up my after-life of Carribee Island series (see 1880s, 1890s, WW1, 1939) for a while. I’m going to start this one with going right back to a time when this officially-designated Unhealthy Area was being torn down and its residents dispersed through Wolverhampton. Typically, those in poor rented accommodation suffered the worst through slum clearance schemes and were often displaced only so far as the nearest surviving lodging-house. Thus, those from Carribee Island – including much of the Wolverhampton’s large Irish population – are unlikely to have gone far. One example from my research for instance is James McNay – when finally evicted from Cole’s Croft, he got as far as Canal Street: probably 100 yards at most. And so the institutions that served them remained too. The East side of Carribee Street (now Westbury Street), and the decent buildings on the West side, were not knocked down, leaving pubs, houses and St Patrick’s church intact. On Monday 28th May 1883, the landlady of the Elephant & Castle, on the corner of Stafford Street and Cannock Road, married a young Irishman twenty years her junior at St Patrick’s. Agnes was born in Walsall in 1842 and baptised at St Mary’s Catholic Church as Agnes Brodhurst. The family was reasonably well-to-do: her father, the wonderfully-named Kelita Brodhurst, set himself up as a bit and bridle maker at 103 Walsall Road, Bloxwich, not long after Agnes’ birth and by 1861 was employing ten men and two boys. His wife, Ann Bird, was a descendant of Richard Penderel, most famous for helping shelter Charles II at Moseley Old Hall – we’re talking an English Catholic family of long and high standing. Kelita and Ann retired to Rugeley leaving Agnes as housekeeper at Walsall Road, looking after her brother Vincent who was now in charge of the business. This kind of small, saddlery-related metalwork known as lorinery was absolutely typical of Walsall, and typically carried out in small workshops – Vincent was in charge of 16 men by 1871, including his brother, the aptly-named Penderell. Agnes tried her hand at boot-making afterwards, but in 1881 gave this up to take over as landlady at a large coaching inn on Stafford Street: the Elephant & Castle. Agnes wasn’t the most-travelled Brodhurst, by a long way. Her older brother Charles and older sister Catherine were born in America: Bridgeport, Connecticut and New York respectively, so Kelita and Ann must have spent some time moving about New England. in the 1830s. They returned when the children were young though, with Charles following his father’s earlier vocation of warehouse and merchant clerk. Catherine embraced her Catholic roots and became a nun, eventually settling as a teacher at the Catholic School in Union Street, Stourbridge. Martha married into the important Walsall family of James Beard but didn’t move far, Eleanor died as a child, and Mary followed Agnes’ suit by becoming landlady of the Green Dragon Inn in Walsall. If you know me you’ll have guessed how I came across Agnes’ story. The Elephant & Castle is one of the two dozen-or-so buildings that we have researched to include within the new Forging Ahead development at the Black Country Living Museum. I should note that our Elephant & Castle is not quite Agnes’: it was knocked down and rebuilt in 1905 in the more familiar Edwardian, faienced guise. Nevertheless, the Elephant of 1881 was a busy pub, employing a number of bar and domestic staff, including John Lacy: a bar manager from Ireland. Not a bad idea – the pub was only 500 yards from the boundary of the demolished area, and the immediate area would certainly have witnessed an influx of Irish labourers and their families in the 1880s. Her husband-to-be, meanwhile, was just a child when Vincent Brodhurst was pouring out his bits, bridles, snaffles and riffs in Bloxwich. Patrick O’Kane was born in the townland of Ovil, a little West of the small town of Dungiven in County Derry, nestling at the foot of the Sperrin Mountains. Dungiven, incidentally, was the heart of the Ó Catháin clan’s territory – anglicised as O’Kane – and features an 11th century priory. Today, it is a staunchly Protestant, DUP-voting area, but as always in Ulster, there is a large Catholic population. Patrick’s father has been giving me some trouble. Catholic participants in baptisms, marriages and funerals were often given latinised names: Patrick became Pahitium and Agnes Agnetem; Patrick’s father though was Canelii, and I can’t work out the English version, so until then I’m stuck. We can only speculate as to what brought Patrick to the Black Country. The first hint of him comes in 1881, when he was working at the Star Hotel on Lower Lichfield Street in Willenhall as a bar assistant. On marrying Agnes he moved into the Elephant & Castle, and – typically for the day – took over the licenseeship. As an Irish Catholic he would of course been an eminently suitable landlord for his local patrons, however, he probably wasn’t quite like most of them. Far fewer emigrants from the province of Ulster migrated to Wolverhampton than from other parts of Ireland. Although it too was sorely hit by the famine of the 1840s, Ulster-born Irish tended to leave from Belfast and thus emigrate first to Glasgow; the shipping line from the Western province of Connacht was the one to dock in Liverpool and its travellers make the long journey South-East to the Midlands. Nevertheless, Patrick O’Kane, a Catholic Ulsterman, found himself landlord of the Elephant & Castle, serving Irish customers in the English Midlands. Patrick O’Kane’s movements around Victorian Wolverhampton © Crown Copyright and Landmark Information Group Limited (2018). All rights reserved. (1889). Patrick was evidently an ambitious man. 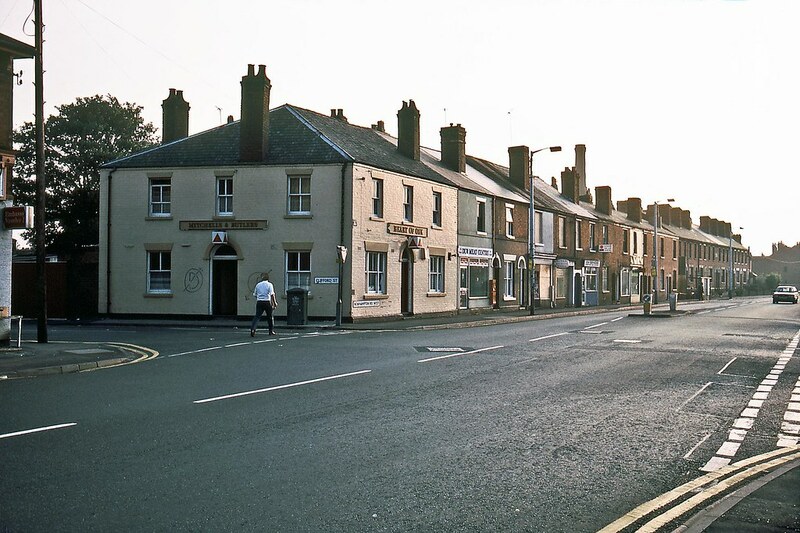 He and Agnes only stayed at the Elephant for around five years (I have Tony Hitchmough’s incredible website to thank for such granular detail) before taking a pub even closer to the former Carribee Island, the Four Ashes on the corner of Stafford Street and Charles Street. He was also charged with improperly taking out a licence for the Sportsman on Walsall’s Stafford Street and installing a “straw man” although it’s not clear what came of that. He and Agnes set up home during the 1890s at a large Georgian house in a fashionable address, 12 Waterloo Road, and was sufficiently well known as to be described as a “prominent Roman Catholic gentleman” in 1895 – albeit one accused of gambling at a fundraising bazaar. At one point, Patrick and Agnes evidently tried something new entirely, running a boarding house on Oxford Road in Boscombe, Bournemouth – a fashionable tourist resort for well-off Victorians by the turn of the 20th century. They called it “Ovill House” after Patrick’s birthplace. 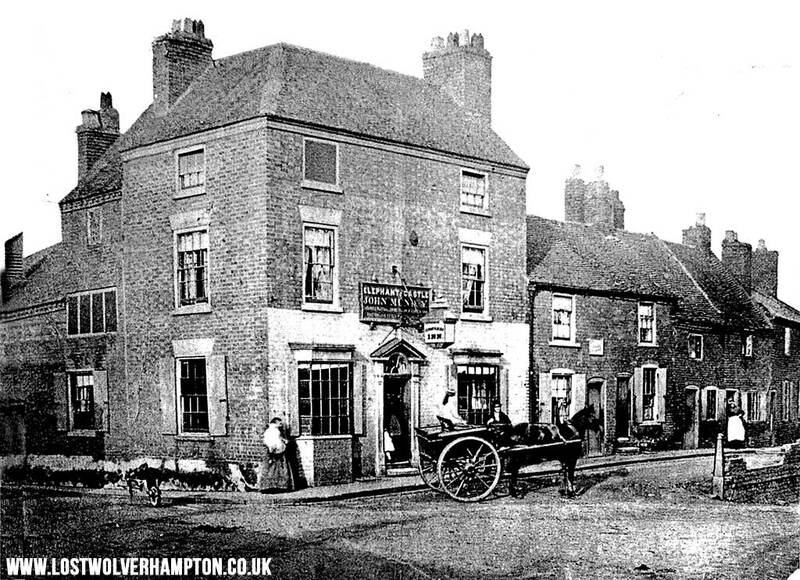 But by 1911, we find them back in Wolverhampton, back in the pub trade: they are landlords of the Hearts of Oak in Whitmore Reans, at the corner of Newhampton Road and Clifford Street. There’s no doubt it’s them – there’s another Brodhurst staying with them, as there often seemed to be: Agnes’ family was clearly close. There’s no sign of any relations for Patrick – not the mysterious father, no children. Patrick and Agnes O’Kane remained at the Hearts of Oak (later renamed the Heart of Oak) until Patrick’s death in November 1926, aged just 63. Agnes moved briefly to Harrogate, but died soon after, in 1929. And there the story should stop. The Irish of Carribee Island were dispersed and their homes and society were buried under new streets, but the people weren’t. They remained local, they still wanted somewhere to worship, somewhere to drink, someone to talk to; even if the names of the customers at the Elephant & Castle or the Four Ashes are lost, we have little links in the socially and spatially mobile lives of people like Agnes and Patrick O’Kane. And there the story should stop, only with my research dotting around all over time and space at the moment, it doesn’t. I am researching the post-war Black Country as well as the Victorian, and the Elephant & Castle specifically. Right through to its closure in the 1990s, and particularly so during the 1960s and 1970s, the majority of its patrons were – you guessed it – Irish. There were Jamaican and South Asian drinkers too. What Patrick O’Kane had capitalised on was clearly not forgotten, and when a new generation of migrants found work in the Black Country post-World War Two, the Elephant was ready for them. In 1965, 12 Waterloo Road was one of the street of estate agents, solicitors etc. that every town seems to have. I can’t tell whether it was the modern building that’s there today, backing onto Corporation Street and the Wulfrun Hall; or whether it was a Georgian house like that next to it. It was occupied by an estate agent, Skelding & Boucher. Why should their name be of interest? They made the local TV news and the national press for enacting a colour bar at the request of the builders of the Lyndale Estate in Wednesfield, banning people of colour from buying their homes (you can see the ATV Today report here). 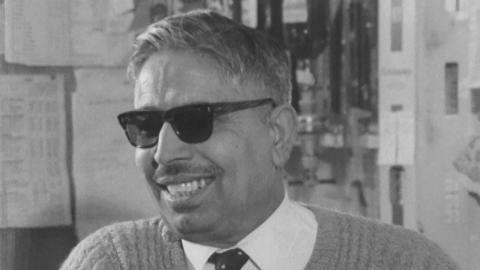 Shortly before the 1965 Race Relations Act banned such discrimination, it clearly caused sufficient outrage locally to warrant widespread condemnation of the agents and builders. Times change, don’t they, and the world moves on and swirls around, but sometimes history reflects itself. We’ve spanned 130 years, crossed oceans and travelled thousands of miles, watched occupations from bit-maker to boarding-house keeper, met immigrant barmen and racist politicians. But we’ve not even moved a mile in Wolverhampton, and the pubs, the offices, the homes are the same. Whether you like it or not, immigration has been fundamental to the creation not just of present-day Wolverhampton, but that of the 1960s, the 1920s, the 1890s, the 1850s. In this it’s a microcosm of Britain: you don’t have to dig to tell the tale of those who’ve moved in and out of Wolverhampton or Britain: they are Wolverhampton and Britain.